Industrial Water Treatment - Water Softening & More - Robert B. Hill Co. In 1958, we got our start as a Permutit Dealer and ever since we have been designing our own equipment. Our industrial department can assist from design and development to start-up of your project. Typically, our industrial systems start at 100 GPM up to any flow rate required for your application. Our industrial capabilities include: Filtration, Water Softeners, Reverse Osmosis Systems, Deionization (DI), Dealkalizers, Arsenic Removal, Radium Removal, Uranium Removal and many other applications. Another common filtration application is the use of carbon. Carbon filtration can be used for the removal of chlorine, benzene, radon, solvents trihalomethane compounds, and volatile organic compounds (VOCs). There are also specialty carbons that remove many other compounds from the water. Due to high levels of calcium and magnesium, many types of equipment fail to work properly, which can lead to an increase in energy costs and/or complete failure of the equipment. Many plants use water softeners for boiler feed, cooling towers, entire water supply and various types of process water. Cooling towers are another common application for industrial water softeners. Cooling towers can operate much more efficiently with softened water. This can help to realize a drastic reduction in maintenance, chemical feed quantity, and the volume of water required for operation. Flow rate and capacity are major concerns when designing a softening system for a cooling tower. A thorough understating of daily water usage and required flow rates are critical. Most customers decide that using water softeners for their entire plant feed water is necessary. Due to high hardness levels the majority of the time, this is the only option as it is usually the most cost effective and protects the entire plant from complications and damage that scale can cause. Our engineers can design reverse osmosis systems for any application. Because we custom design our systems for each individual project, we are not limited by flow rate, size, or customer specific requirements. Most reverse osmosis systems fall into three main categories; traditional, brackish or desalination. Traditional reverse osmosis systems operate with a feed of 200 psi to 400 psi. This means that a minimal amount of energy is used to pump the feed water through the membranes to overcome the osmotic pressure. Brackish reverse osmosis systems tend to operate over 400 psi and require more energy as a higher pressure pump is necessary. Brackish water has higher total dissolved solids than water that is fed through a traditional reverse osmosis system. 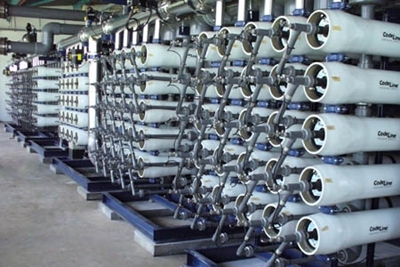 Desalination reverse osmosis systems operate at 800 psi to 1200 psi. At 800 psi and above, a special high pressure pump is required. These pumps not only produce high pressure but need to be made out of special alloys. Because of the increase amount of energy that is required to overcome the osmotic pressure, energy recovery devices are typically used. Deionization systems use cation and anion resins or mixed bed resin to treat the incoming water and reduce the number of total dissolved solids. 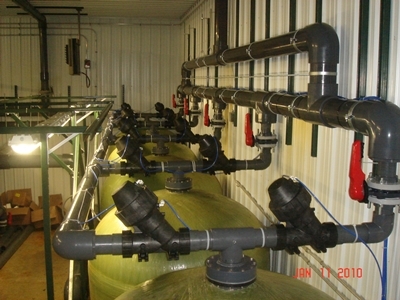 Deionization systems use acid and caustic chemicals to regenerate unlike reverse osmosis systems, which require electricity to power the feed pumps. When applied properly, a deionization system (DI) can be very efficient and produce high purity water. A Dual Bed DI system typically produces 200k water quality versus a Mixed Bed DI system, which can produce as high as 18 mega Ohm water. Dealkalizer systems are typically used in boiler water treatment but can be used in various applications. To design a dealkalizer system, it is important to determine the complete water treatment needs of the customer. This includes the quality of the water needed, the quality of the supply water, flow rate needed, and daily capacity needed. Two main designs that are used for dealkalizer systems are chloride cycle dealkalizers and acid regenerated dealkalizers. Both systems have many positive aspects and are used according to the specific needs of the customer. Arsenic can be removed in several different ways. Reverse osmosis can be very effective, but there are other ways to treat arsenic as well. One way is to use selective media that removes arsenic and does not require regeneration. When designing the system, calculations are used to figure out the life expectancy of the media as it will be dependent on water volume and the levels of the arsenic in the water. Once the media is exhausted, it must be removed from the system and replaced with new media. There are two types of arsenic; Arsenic III and Arsenic V. Arsenic V is typically easier to remove than Arsenic III, so a complete water analysis must be completed before designing a removal system. The current maximum contaminant level (MCL) set by the EPA is 0.010 milligrams per liter (mg/L) or 10 parts per billion (ppb). Radium can be removed through water softeners, reverse osmosis, and selective radium resins. Selective radium resins remove radium and do not require regeneration. When designing the system, calculations are used to figure out the life expectancy of the media as it will be dependent on water volume and the levels of the radium in the water. Once the media is exhausted, it must be removed from the system and replaced with new media. There are two types of radium; Radium 226 and Radium 228. The maximum contaminant level (MCL) set by the EPA is 5 picocuries per liter (pCi/L). Uranium removal systems consist of resin that removes uranium without the need for regeneration. The resin has a finite capacity that is dependent on the volume of water and the amount of uranium present in the water. Once the media reaches its maximum capacity, the resin is removed and must be sent to a nuclear waste site. Because the levels of uranium in the media are concentrated, the media must be removed using special equipment, and security precautions must be taken to avoid unauthorized access to the material. The appropriate federal government agencies should be notified and involved during the entire process. Below is a list of some common markets that we are involved in. The fracking process occurs after a well has been drilled and steel pipe (casing) has been inserted in the well bore. The casing is perforated within the target zones that contain oil or gas so that when the fracturing fluid is injected into the well, it flows through the perforations into the target zones. Eventually, the target formation will not be able to absorb the fluid as quickly as it is being injected. At this point, the pressure created causes the formation to crack or fracture. Once the fractures have been created, injection ceases and the fracturing fluids begin to flow back to the surface. Materials called proppants (e.g., usually sand or ceramic beads), which were injected as part of the frac fluid mixture, remain in the target formation to hold open the fractures. 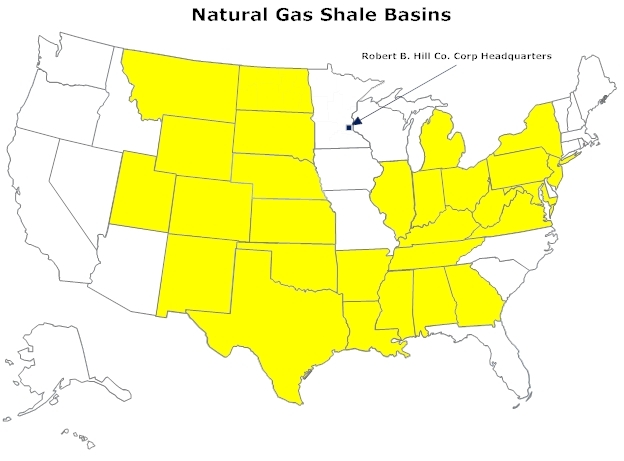 Studies have shown that anywhere from 20-85% of fracking fluids may remain underground. Used fracturing fluids that return to the surface are often referred to as flow back, and these wastes are typically stored in open pits or tanks at the well site prior to disposal. The Robert B. Hill Company has the experience to treat water used in Fracking, which was previously thought to be untreatable. In the past, the waste water from Fracking was disposed of through deep well injection, but many states do not allow for this. This has created a problem as the industry has expanded throughout the United States. The Marcellus Shale is starting to be heavily developed, which is creating a problem as there is no long term plan for disposing of the frac water. Most of the water is shipped outside of the state where the drilling occurs or is sent to POU’s that do not have the ability to treat the water and have little knowledge of how toxic the water can actually be. This can create long term environmental problems that are not fully understood until the contamination is found in streams, landfills, and drinking water. How do you treat water that has high TDS, uranium, radium, silica, chlorides, TOC, iron, free oil, and many other compounds? The basic answer is that it takes a lot of research and design to develop a viable method of treating the water. We have done the work and can design a program to treat the entire process through a full treatment plant or a segment in your current process that needs to be altered. A full treatment plant typically can consist of 18 to 25 steps to get the water to potable quality depending on how complex the waste water stream is. We can design a plant to treat 50,000 gallons per day or as high as 10 million gallons a day. Below is a list of the typical compounds found in frac water. Established in 1981, Purolite has become a leading supplier of specialty resins for the ion exchange, catalyst, absorbents and specialty applications markets worldwide. They have manufacturing facilities in Philadelphia USA, Victoria Romania, and Hangzhou China. Their products are widely used in: pharmaceutical production, microchips, potable water, chemical and refining industries, catalysis, the food and beverage industry, metals extraction, metals finishing, electroplating, nuclear power generation, chromatographic separation and adsorbent chemistries. Below is a small sample of theirproducts. A blend of proprietary and patented resins, is designed to reduce membrane fouling by removing colloidal and organic matter from the feedwater. Ithas been demonstrated to minimize fouling by reducing feedwater silt density index (SDI) by over 40% and total organic matter (TOC) by up to 85%. SDI values as low as 1.5 have been achieved. A proprietary blend of special and patented anion exchange resins used for removal of tannins and organic matter in water used primarily for potable applications. PuroliteTANEX is useful in reducing more difficult-to-control organic matter and color that may exist as partially dissolved and partially colloidal in nature. A Type 2, strongly basic gel anion exchange resin with outstanding operating capacity and excellent regeneration efficiency. Purolite A300 removes all ions including silica and CO2, however, it operates best on waters having a high percentage of strong acids (FMA). Purolite A300 can be used in all types of demineralization equipment where regeneration efficiency and high operating capacities are needed. A clear gel Type 1 strong-base anion exchanger with both high operating capacity and the ability to achieve low residual silica levels. Minimal quantities of caustic soda are required compared with those typical of the classical Type 1 (Purolite A600) quaternary ammonium structure based on polystyrene. It has a clear gel structure, showing excellent regeneration efficiency and rinse characteristics. A macroporous strong base anion resin which is specially designed for the removal of nitrates from water for potable processes. The macroporous matrix and special ion exchange group functionality imparts ideal nitrate selectivity to Purolite A520E making this resin particularly suitable for nitrate removal even when moderate to high concentrations of sulphate are present. A special macroporous strong base anion resin crosslinked with divinylbenzene that is specially selective for hydrophobic anions. It shows good mechanical strength and an excellent resistance to osmotic and thermal shock. The macroporous matrix and special ion exchange group functionality imparts an especially high selectivity of Purolite A530E for perchlorate and pertechnetate. A high purity premium grade bead form conventional gel polystyrene sulfonate cation exchange resin designed expressly for the treatment of foodstuffs, beverages, potable waters, and water used in the processing of food. Its specification is such that it will exceed the relevant EEC requirements, and the resin is in compliance with the U.S. Food & Drug Administration. A premium grade of conventional gel poly(styrene sulfonate) cation-exchange resin of exceptionally high purity, specially manufactured for use in demineralization of solutions destined for potable use or treatment of foodstuffs, beverages, potable waters and water used in the processing of food. Is a high efficiency softening resin based on shallow shell technology. Simply stated, the shorter the diffusion path, the more rapid the softening exchange occurs. This is particularly important during regeneration. Reducing the depth of penetration required to cleanse the resin allows for a more complete regeneration and provides a higher, more efficient utilization of the regenerant.